It's March! In Wisconsin we hope to see crocuses bursting from under melting snow. The official first day of spring is marked on the calendar, so summer, green grass and the first game of golf aren't far behind. It is definitely the right time to consider commercial outdoor furniture from Systems Furniture for your corporate outdoor space, college campus or residential patio. For business– Having a place for employees to enjoy an outdoor break or lunch is a big plus. Employees come back to work refreshed and ready to focus. Outdoor tables like the Janus et Cie's Dolce Vita table and Koko armchair add a relaxed vibe. Colorful Spark chairs from Knoll come in red, blue and citron as well as grey and black. Because they are stackable and portable with a Spark dolly, a team gathering can happen anywhere from a building atrium to the nearest shaded patio. On campus– Giving students an outdoor place to relax is a great way to create a sense of community. Knowing that the products are durable and easy to maintain is important. "Commercial outdoor furniture needs to stand up to all the weather and still be comfortable,"said Stacey Prodoehl, account manager and education specialist at Systems Furniture. "Rainstorms happen. Outdoor furniture should shed water, be heavy enough to stand up to the wind, and still be easy to move." Landscape Forms's Towne Square bench and Parc Centre table are finished with a polyester powder coat that resists rusting, chipping, peeling and fading. Cleaning is as simple as using a soft cloth or brush and a mild detergent. Residential users—Nothing is better than spending time on your patio or deck on a summer day. 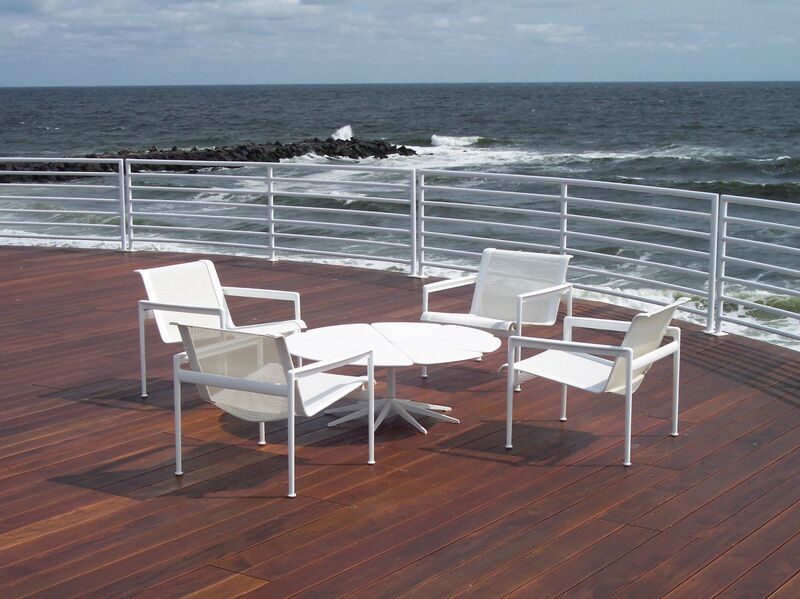 Choosing commercial outdoor furniture ensures that you can enjoy a well-made product for a long time. Knoll's Richard Schultz 1966 collection includes lounge chairs, dining tables, dining chairs and chaise lounges and continues to look fresh and modern in 2019. Knoll's Washington Skeleton chair, designed by David Adjaye, attracts attention with a unique lattice back and perched legs that support the cantilevered seat. A full range of commercial outdoor furniture options are available when you call Systems Furniture at 920-336-1510. Check out our office space design and furniture expertise on our website, sysfurniture.com. Whether you are in Appleton, Oshkosh, Green Bay or Rice Lake, Systems Furniture's team is ready to bring the best of summer to your business, school or backyard. View original article on commercial outdoor furniture here.